There is NOTHING more exciting than a new DCI Ryan book being released. LJ Ross has a 'Bypass the TBR pile' card up her sleeve as I, like many readers up and down the country, frantically finished the book I was reading to start this next instalment. I ignored the clock that would have told me it was way past my bedtime, if I could have torn my eyes away from the page to check the time. 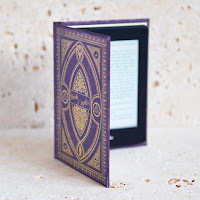 Instead I read on and greedily devoured every page as if I had suffered a reading famine. 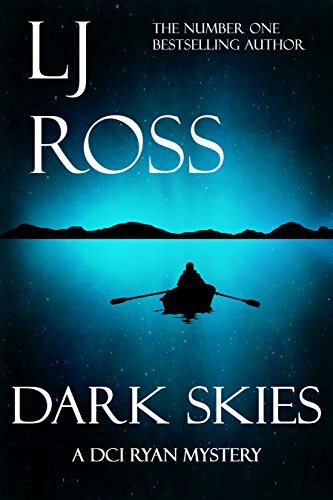 The chilling prologue of Dark Skies takes us back to 1981 before Kielder Water, a large man-made lake existed, instead it was a small village surrounded by Kielder Forest. One of the teenage villagers, Duncan Gray, went camping with friends unaware that he would never return home. There was an investigation into his disappearance at the time but, when his mother receives a postcard apparently from Duncan, it is assumed that he is simply a runaway. His mother holds on to that thought as the alternative is too awful to imagine. While Ryan has been on honeymoon, some things have changed in Northumbria CID with the arrival of DCS Jen Lucas. Jen is bitterly holding a massive grudge after Ryan ended their relationship several years ago; she is one nasty piece of work and she's playing the long game, but who will end up as collateral damage? When Jen starts manipulating certain people I was reminded of the rhyme: come into my parlour said the spider to the fly. This is a story we haven't heard the end of and it means we're guaranteed more DCI Ryan books - hurrah! LJ Ross continues her love affair with the beautiful North East in this latest instalment of the DCI Ryan series. After each book, I find myself remarking that this latest book is my favourite...then another one comes along. So I think that this is absolute proof that each book is getting better and better, although every single one of them is brilliant but how do you improve on perfection? I don't know, but LJ Ross certainly seems to do it every single time! I love the sprinkling of North East history in each book; some I knew, some I was shocked to find I didn't know and other things I had forgotten. I was reading Dark Skies and was amazed that there used to be a village beneath Kielder Water...then a few minutes later I thought, hang on...I knew that. LJ Ross is way better than a guide book and I don't think it will be long before visitors come to our region especially to see the places in the books. It really is as stunning and picturesque as LJ Ross paints it, and I used to take it for granted until I saw the area through her eyes. They don't come any better than this - it's a well deserved 5 stars from me. 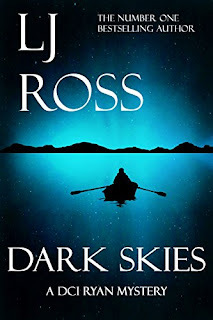 I should have kept my review short as you could have been reading Dark Skies instead of reading about it. So here's my alternative review in 4 words: JUST GO BUY IT!